Víctor Medina, 48, collapsed in the city’s Humboldt Park neighborhood January 5 while trying to clear out his family’s parking spot. Early January’s bout of snow and cold brought the usual media tally of winter-related casualties, including four men in the Chicago area who suffered fatal heart attacks while shoveling snow. You never know it from the death count, but each victim has a story. On Tuesday, relatives of Víctor Medina laid his body to rest. 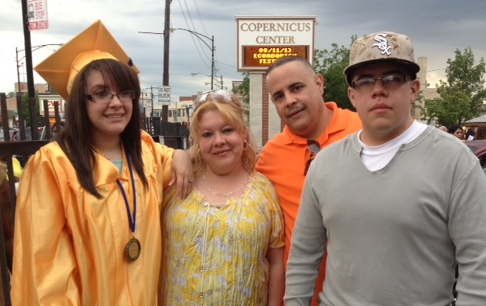 Medina, 48, collapsed in the city’s Humboldt Park neighborhood January 5. He was trying to clear snow from the parking spot behind his family’s apartment. I see that parking spot every time I take out my garbage. I see the apartment every morning through my kitchen window. Víctor was my next-door neighbor. I chatted with him in passing, now and then, but another guy in my building knew him much better. Víctor also kept an eye out for people who did not belong around his building — or ours. He thwarted three burglary attempts on our property and, a couple summers ago, he alerted us to something else. “Your back fence is on fire,” Jason recalled Víctor informing him over the phone. Víctor also watched out for his two kids, especially his daughter, Dalysha, 19. “It was pretty bad growing up in Humboldt Park and hearing all of the gunshots through my window and having to be scared,” she told me. She said his response was always the same: No. The only way Dalysha could venture down the block was hand-in-hand with him. That sort of parenting seems to have paid off. Dalysha made it into Dominican University, where she is a freshman. Her brother, Kelvin, 20, is a private in the U.S. Marines. Víctor pushed his kids to go places he could not. Raised in Ponce, the Puerto Rican city, he had 15 brothers and sisters. As a young man, he migrated to Chicago and ended up working mostly kitchen jobs. He worked, that is, as much as his health allowed it. Víctor had deep vein thrombosis, heart problems and high blood pressure. The heart attack that killed him was his fourth, Dalysha said. In a typical U.S. winter, roughly 100 people suffer fatal cardiac arrests while shoveling snow. Considering Víctor’s medical conditions, I had to ask his family the obvious question: Why on earth was he out shoveling? “Víctor said, ‘If I don’t do the shoveling, who’s going to do it?’ ” his widow, Jeanette Vázquez, told me. Jeanette said she would plead with him. She would insist that snow shoveling was the landlord’s responsibility. But after 26 years together, she knew she had little chance of changing his mind. “That was Víctor,” she said. I wasn’t all that close to Víctor. I did not know him beyond what we could express over the fence in a minute or so. I never seemed to have more time. But I will think of Víctor whenever I see his daughter getting home from a day of classes. I will think of him the next time someone tries to break in to our building. I’ll remember him whenever snow has buried my car. Whenever I’m shoveling out.